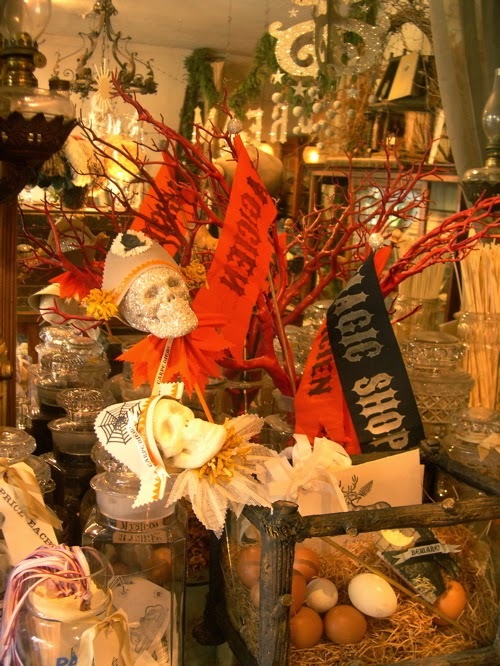 Happy Holidays: The Magic Shop. In January I was trying to come up with a general theme for this year. Nothing was particularly exciting. Then I came across this image of a display of merchandise designed by Wendy Addison. It wasn't the display that caught my attention but the black banner that has the words "MAGIC SHOP" on it. That was it. 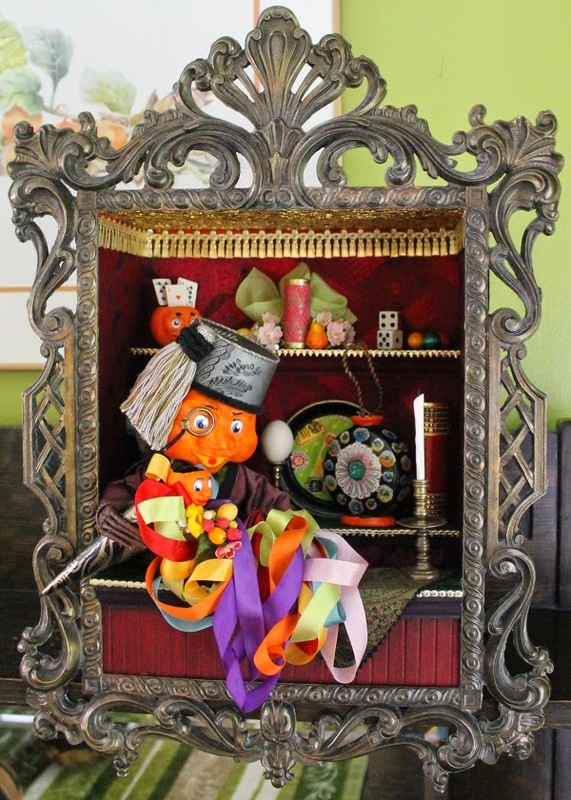 I love magicians and have done pieces featuring the Man-in-the-Moon and various veggie guys before performing magic tricks. Thank-you Wendy! 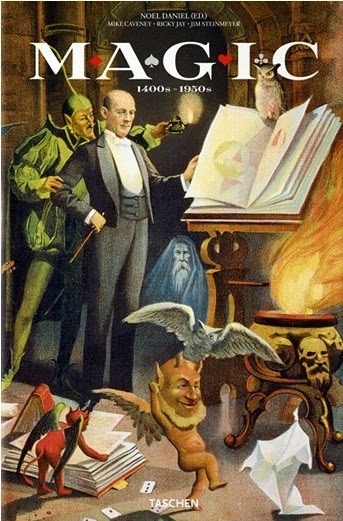 I poured through my wonderful book on the history of magic. 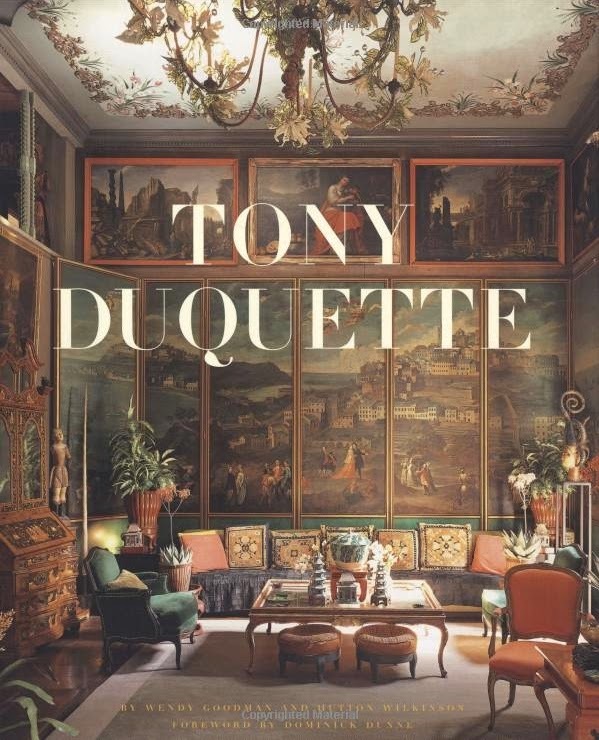 I picked up this book about American artist and designer Tony Duquette at HomeSense for a fraction of the retail price. His design style was totally over the top. He designed interiors, jewelry, costumes, as well as movie and stage sets. There is another book out about him called "More is More". The title of that book sums up his design style perfectly and I couldn't agree more myself. A definite influence on the shop interior. The Sunday after the Hallowe'en and Vine show we went to Berkley and visited "Castle in the Air". What a wonderful shop! I will do a blog post soon about "Castle in the Air" very soon. They have an amazing selection of Dresden trims, I didn't buy any because I have a large stock of my own on hand and haven't thought of using them due to "tunnel-vision" on my part. Inspiration was all around me. 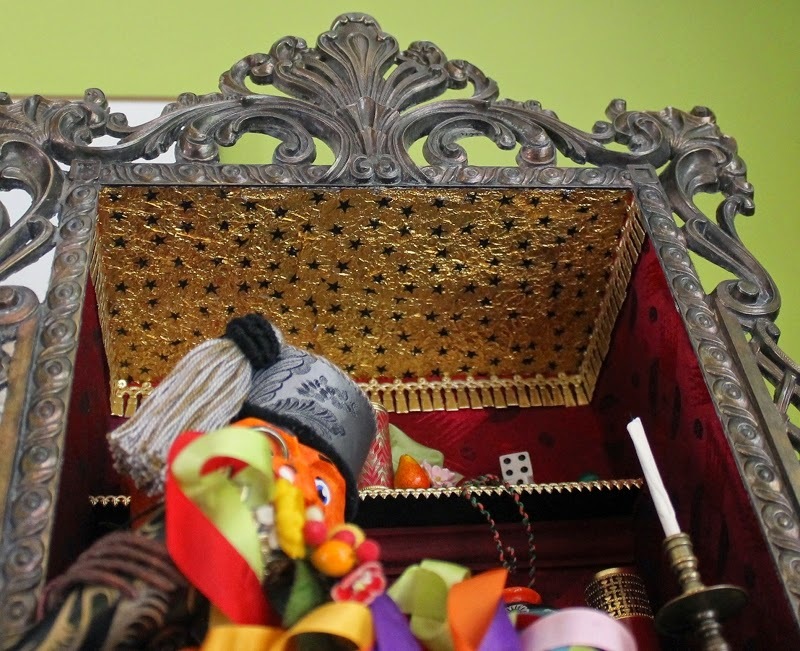 The store itself is decorated with giant Dresden trim that is also available to purchase. 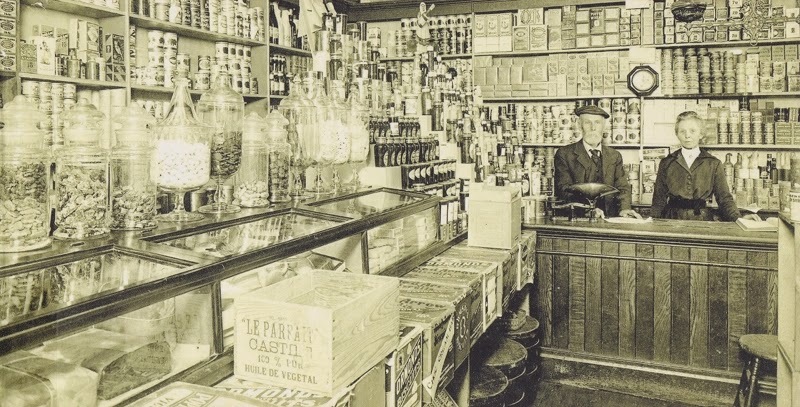 I searched out images of old shops and came across this picture of a grocery store in Victoria. I liked the counter. Now that all of my inspiration preamble is over here it is, "The Magic Shop". The frame is 13" wide and 20" high. The shop is 5 1/2" deep. The magic shop salesman demonstrating the trick projects out of the frame making the entire depth of the piece 8". It can sit on a shelf or hang on the wall. I have to show you the ceiling. I collect all kinds of things to use in the sculptures. This last Christmas we bought some chocolate Christmas decorations to hang on everyone's stockings. I kept as many of the foils that covered each chocolate ornament as I could get my hands on. They became the ceiling in this wonderful little shop. I would love to design a full scale store like this. I must get back to work. I have three large oval frames that I am working on. Awfully cool Len, I love it!! !